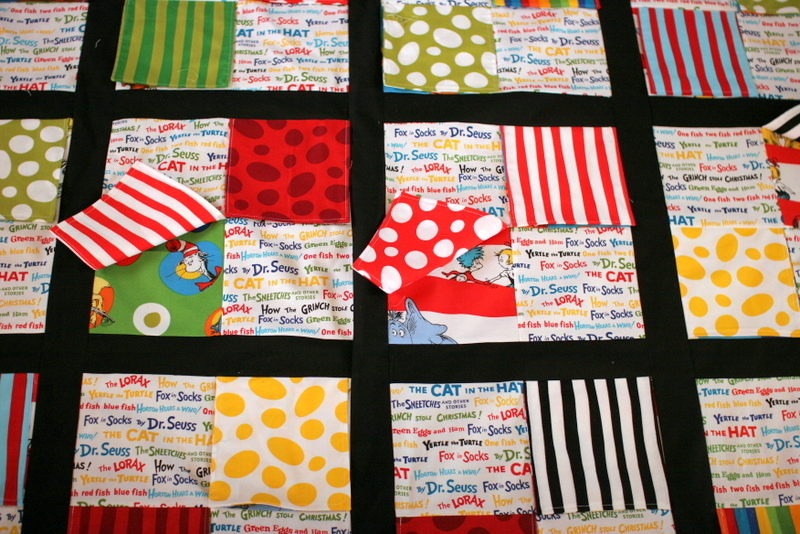 I made this Dr. Seuss-themed quilt for H’s first birthday, but I never put together a tutorial for it. 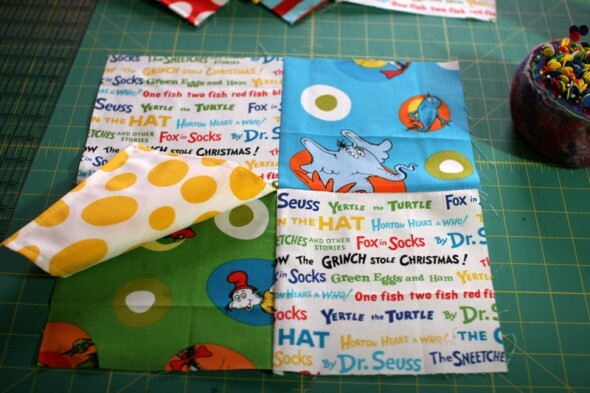 So, in honor of Dr. Seuss’s birthday today I thought I’d post some instructions for this one! You can obviously use any fun kid fabrics you have, but I’m not a big fan of pastels. I love this stark black contrasted with bold and bright primaries. 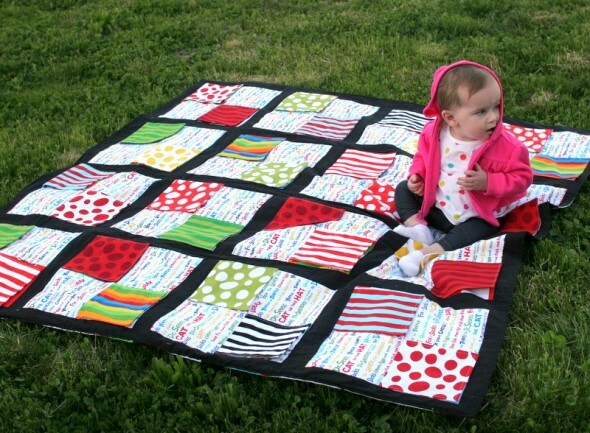 The finished size of this quilt is 60″x60″. I made 16 blocks that were basically a 4-patch block with 12″ finished blocks, with 2.5″ (finished) of black sashing in between. I used twelve fat quarters to make the flaps alone. You need 32 flaps for this quilt, and I got 3 flaps from each fat quarter (I had some fabric left over). To make the flaps, I folded the fat quarters in half right sides together and cut 6.5″ squares on the fold (so unfolded they were 6.5″ x 13″). Then with right sides still together, I sewed a 1/4″ seam along the two sides next to the fold, leaving the side opposite the fold open. Then I turned each flap right side out and topstitched the 3 closed sides (including the fold) down. And voila, flap! Like the red and yellow pieces below. 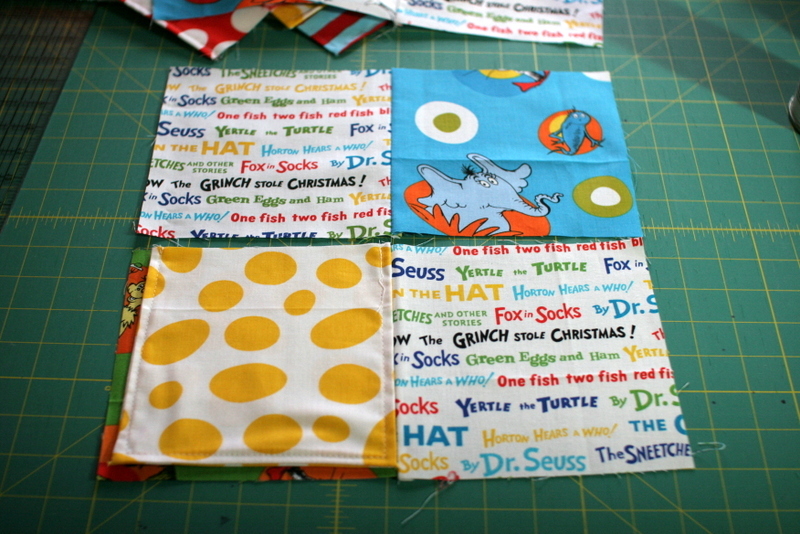 Then for the rest of the blocks, I decided to use a text print (in the above photo) and some of the Dr. Seuss prints with characters (instead of just dots and stripes) to fill out the 4-patch. 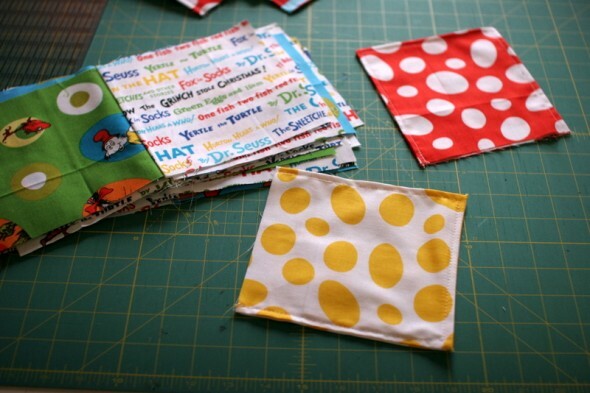 You will still need to cut 4 squares for each 4-patch, the flaps go on top of these blocks. So I cut 32 6.5″ squares from the text print (about a yard) and 32 6.5″ squares from the character prints (about 1/2 a yard of two different prints). I sewed the text and character squares together in pairs of two, half with the text on the left and half with the text on the right (also like in the photo above). I did not sew complete 4-patches together yet, I added the flaps first. 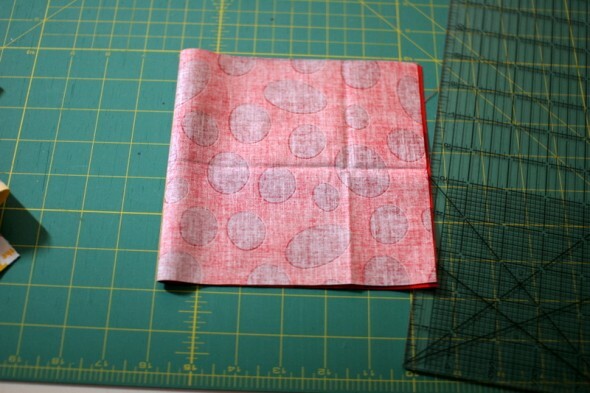 When I was ready to make blocks, I sewed the bottom flap on first. I matched up two text and character pairs, with the text in the opposite placement. I pinned a flap over the bottom character print., aligning it to the top edge and middle seam. You can see above that this leaves about 1/4″ of space to the left and bottom of the yellow flap, but that’s the seam allowance when piecing this block into the quilt. So, once I had the bottom flaps in place, I sewed the top two squares to the bottom two squares. Now I had my 4-patch block with one flap, and it was a 12.5″ block unfinished. I made all 16 blocks like this, with just a flap at the bottom, before I added the second flaps to the top right corners. Okay, so once the 16 blocks were made, I was ready to sew on the second flap to the top right corner. 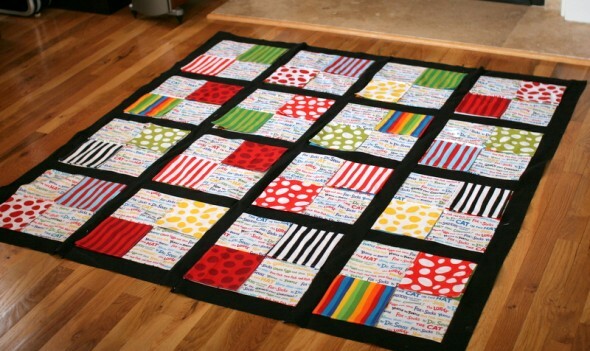 I used 3″ width strips of black sashing fabric in this quilt, so I cut 16 strips that were 3″ x 12.5″ to sew to the top of the blocks. Rather than do large sashing pieces here, I used pieces that fit the blocks so I could secure the second flaps. I pinned the top flap the same way I did the bottom, aligning it to the top edge of the 4-patch and the center seam. Then I pinned a sashing piece to it, right sides together, and sewed a 1/4″ seam. 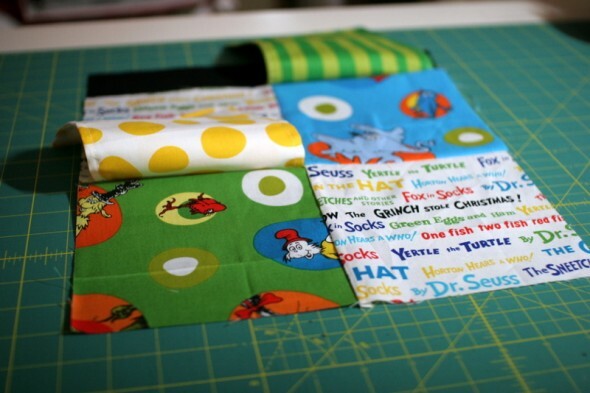 So then I had a 12.5″ 4-patch square, with two flaps attached and a top sashing strip. When all of those blocks were complete and both flaps attached, I pieced the entire quilt together using 3″ wide strips of solid black as sashing (be careful to keep the flaps pulled to the side when sewing seams next to them, otherwise you’ll sew down the corners of your flaps–this will make them hard to open). I pieced the black strips where necessary to get a long enough strip. Finished, this made the top 60″ x 60″. 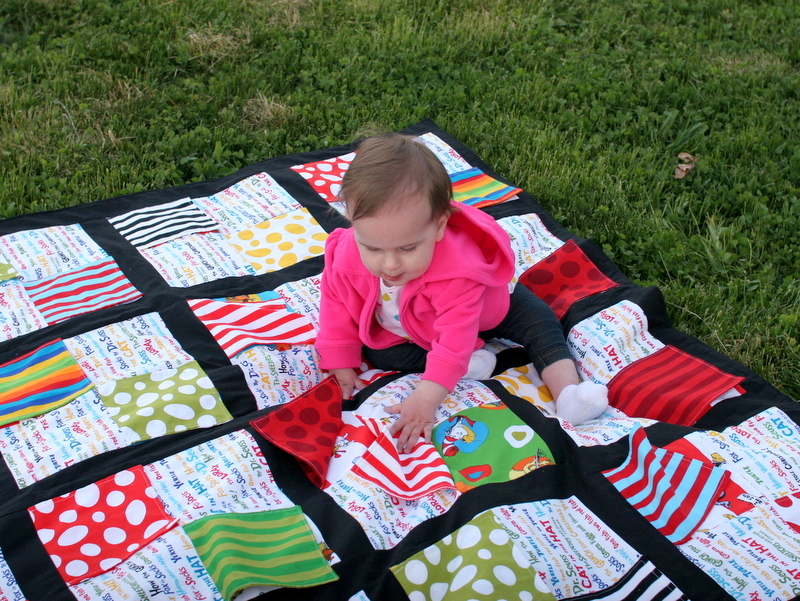 Now, because this quilt had flaps, I didn’t sandwich it and quilt it all over. I cut the batting and backing to fit the top, and I pinned the top and backing right sides together, then I pinned the backing to the top of that sandwich. I sewed it all the way around like I would a pillow, leaving about a 12″ gap on the bottom edge to turn the whole quilt right side out. Then, I folded those seams in (just like with a pillow), pinned them, and I topstitched a 1/4″ seam all the way around the edges of the quilt to close it completely. I did a few zigzag stitches in black thread around the sashing, just to hold the quilt in place like I was making a tie quilt. This held the layers together without me having to work around the flaps. And it gave this quilt a really light feel to it, like a comforter. It traveled really, really well.